The latest offering from Bluedio is a one of a kind headphone made for demanding users, who are looking for a wireless headset at a very low price. Bluedio is a brand specialising in wireless headphones of quality that can win over any audiophile, and are priced at the lower end of the spectrum. The Bluedio H-Turbine Headset comes with several high tech features that are usually found in very expensive headsets. The H-Turbine headphones are by no means perfect, but they are a shadow of a doubt the best Wireless and high-tech headset you can buy within their price category. 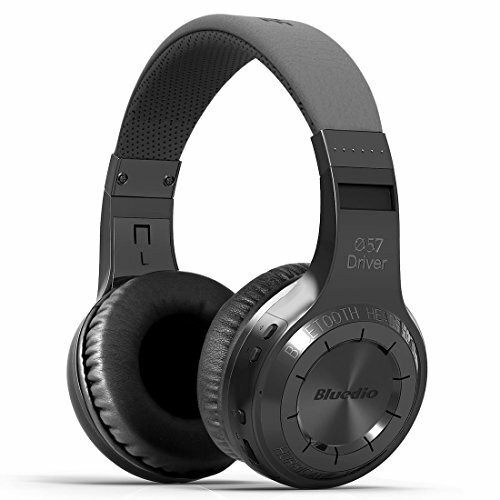 The updated version of Bluedio H Turbine Headphones, the T2s are considered one of the best wireless headphones, and have received many positive reviews from users and industry experts alike. First and foremost, the Bluedio HT features a Bluetooth functionality which eliminates the need or necessity of cables, and makes listening to music hassle free. This functionality also eliminates the need for a jack input, detachable or otherwise. Without cables, transporting a headphone is much easier, however, one can also buy an audio cable separately and plug that into the headphones, without using batteries. The next impressive feature of the Bluedio H turbine Headphones is their built-in microphone that allows you to seamlessly switch between calls and music. With regards to the audio performance of the H-Turbine, its technology is underpinned by two 57mm drivers, which produce a quite well-balanced sound, with a clear bass, and impressive mids and treble, which enable you to listen to the tiniest details of a song. As far as the comfort of the H Turbine is concerned, the supra aural ear cups fit nicely in and are both comfortable and durable over long hours of use. The headband is fully adjustable and overall gives a comfortable fit. The material also feels very natural on human skin. The language prompt on the Bluedio H-Turbine Headphones comes in four different languages, that is, English, Chinese, French and Spanish so that you can acclimatise yourself to these headphones and know what to do next while using them with ease. Overall, the Bluedio H turbine Headphones is one of the most successful headsets that Bluedio has yet produced. It is fully compatible with iOS, Android and Windows platforms, so people can use them with any smart gadget of their choice. They are priced nearly 5 to 6 times less than most headphones with similar specs and thus offer an unmatched value for money. WHAT ARE THE KEY FEATURES OF Bluedio H-Turbine? First of all its outstanding design and style. In the past some people believed that one of the previous Bluedio headsets looked like Beats. This Bluedio’s response to these critics, as theH Turbine has its own distinctive character, which is characterized by a modern and high-tech style. Strong bass that is underpinned by 57mm ultra-large dynamic drivers. Its bass is clear and yet transparent and that guarantees that your favourite tune won’t be distorted by its strength. A fully customized function which allows users to connect to another H headphones via a cable, and share music with your friends. It also allows users to connect two Bluetooth devices at the same time, connects with your phone and tablet seamlessly. Flexibility and comfort are exceptional. The H Turbine has custom fit supra-aural soft earmuffs, artificial protein leather of earmuffs simulated to human skin texture which ensure long lasting comfort. Better battery and upgraded Bluetooth Functionality. The H turbine has a new Bluetooth 4.1 operating system, which offers ultra-long using of 40 hours music, 45 hours talk and 1625 hours (approximately 67 days) standby time. The battery consumption has decreased up to 40% power compared to the previous Bluetooth 4.0. technology. Noise cancellation and noise reduction effectively reduce ambient noise while talking. Along with 66 Audio BTS+ and August EP650, the Bluedio H-Turbine is one of the best wireless headsets that can someone buy these days below $50!